From blissful spas and cool cultural events to wild mountain coasters and thrilling zipline tours, there’s even more to love this Winter in New York! 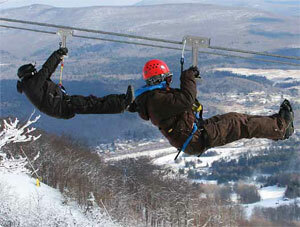 One of the hottest new ways to ride a New York mountain is by Alpine Coaster! Similar to a roller coaster, cars on a track take you up to the apex for a thrilling ride down, zigzagging and spiraling all the way! Check out the new Mountain Coaster at Holiday Valley resort in Ellicottville (716/699-2345; holidayvalley.com) and the Alpine Mountain Coaster at Greek Peak Resort (800/955-2754; greekpeak.net) in the Finger Lakes region. Other new adventure attractions across the state include Big Bear Ziplines (888/947-2294; bigbearziplines.com) at Hyde Park in the Hudson Valley. In the Catskills, the New York Zipline at Hunter Mountain, the longest and highest in North America, offers thrills for the whole family with zips and canopy tours from tame to wild. Yep; you can zip year-round! 518/263-5580; huntermtn.com.